Albert range is specially developed for professional work shops, small manufactures, garages, painting shops, carpentry industry, furniture production or packaging plants. Albert range is the result of a new design overview of screw compressor construction. We are using a large low speed air end for relative small compressors. The electric motor is directly coupled to the main air end rotor, which essentially reduces the maintenance cost, in contrast with the belt driven compressor or a compressor with gear box. Compressor output is controlled either as for piston compressors by an on/off switch, depending on the pressure in the air chamber or by classic suction regulator with a new control system depending on the pressure level, or possibly by advanced continuous regulation of operation, which optimises the machine’s performance parameters in real time by smoothly changing revolutions depending on the volume of discharged compressed air (see ALBERT Vario). Due to low RPM we can reduce the number of components and increase the reliability. 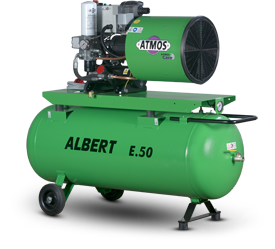 One of the main benefits of Albert range is low noise level in contrast with piston compressors and our competitors.